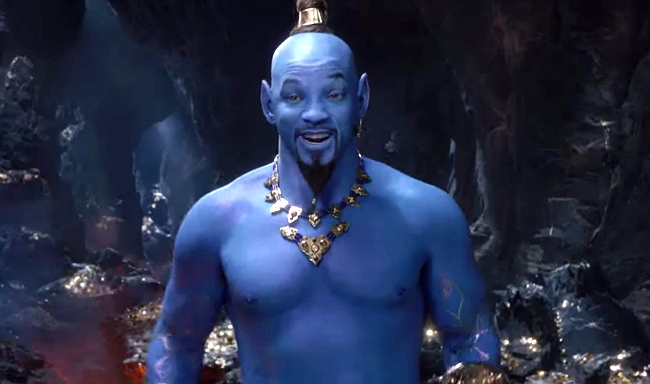 A new TV Spot gives us our first full look at the new blue-Will and it’s, well, it’s a blue Will Smith looking a bit more jacked than usual. We’re not sure what else we expected but it’s certainly what it says it would be. Aladdin is directed by Guy Ritchie, and stars Will Smith as the Genie, Mena Massoud as Aladdin, Naomi Scott as Princess Jasmine, Marwan Kenzari as Jafar, Navid Negahban as the Sultan, Nasim Pedrad as Jasmine’s handmaiden, Billy Magnussen as a potential suitor for the Princess, and Numan Acar as Jafar’s right-hand man. The movie will feature new songs by Alan Menken and La La Land songwriters Benj Pasek and Justin Paul (Menken originally collaborated with Howard Ashman and Tim Rice for the music in the 1992 animated version).